The Paasche 62-Sprayer is a powerful tool for many touch-up paint applications. It will help you easily handle light, medium, and heavy fluids without spending much time on your job. Along with that, its simple design will enable you to operate the spray gun in comfort. As this Paasche Sprayer is made to use with different mediums it has quickly found its usage among lots of specialists involved as in food processing, and in wood and metal finishing. For example, with the Paasche 62-Sprayer, bakers, confectioners, and candy makers can apply various fine granules, sugar, powder, and so on. 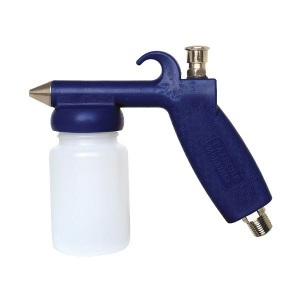 Besides, the sprayer is excellent for work with paints, varnishes, lacquers, stains, oils, fixatives. That’s why this spray gun will be a very useful tool in decorating shop windows, auto finishing, and also revitalizing and restoring furniture. The difference between them is in the head size allowing for some variations in the viscosity of mediums used. If it is a light fluid like ink, dye, or watercolor, the Paasche 62-1-3 siphon feed single action sprayer will be a perfect choice that can ensure fine atomization. Heavy fluids such as auto enamels, acrylic paints, or ceramic glazes require faster atomization which the Paasche 62-2-3 siphon feed single action sprayer can easily provide. 40-60 PSI for heavy fluids.